During the 1970s, the Free Jazz players in NYC began to develop bands, music and venues which were able to make use of the (then) growing number of abandoned buildings in Manhattan to raise venues and rehearsal spaces for the music, which at the time was being shunned by the music mainstream. Groups could find spaces in which to live and work within the peculiar urban context of NYC, cradle of the only cultural artifact American Capitalism has produced. Saxophonist Sam Rivers was one of those who took part in expanding the presentation of the music, opening the Studio Rivbea on Bond Street in 1972, hosting concerts by the cream of the American/ International community of Improvisers rooted in the FreeJazz esthetic. STUDIO RIVBEA became the center of this activity during the 1970s, with Rivers teaching, advising and inspiring a whole generation of Improvisational Free thinkers, as well as stressing the ultimate in instrumental craftsmanship! Musicians could come, meet and check each other out, which spawned different groupings as well as introduce young players to audiences. Audiences were charged small fees for entry, and a small fee was charged to musicians attending classes with Rivers, but all assets taken from listeners were turned over to the musicians performing! The activity that spilled out in the area around Rivbea could be seen by NYC historians as the spark that got the Bowery rolling, and may have been the inspiration for the area's first 70s revival as home to NYC's music community! Originally having met at RIVBEA, Reeds man/Trumpeter Daniel Carter began a cooperative group with Drummer/Percussionist Roger Baird They immediately began working within a rigorous rehearsal schedule, shaping a music that was COMPLETELY IMPROVISED, yet possessed an organic drive and it's own melodic sense. They began to collaborate with other like-minded players, adding Bassist William Parker, Trumpeter Malik Baraka, and Violinist Billy Bang. BassGuitarist Earl Freeman was an active member in the Ensemble's early days, but sadly does not appear on this recording. The pieces that appear here were recorded during live performances in 1974-1975, and are fine displays of what this group's music was about, how it worked, and where it took listeners willing to expand their musical horizons! Track one, "Stance Dance," was recorded 4/24/74 at Kingsborough Community College in Brooklyn NYC, and opens with a pedal point held by Trumpet, Violin and Bowed Bass, with lyrical counterpoint by Alto Saxophone, and dynamic rolls and fills by Drummer Baird. Violin, Alto and Drums begin to probe ahead, the horns masking and responding to the melodic fragments being played. The players interact with each other on a very high level, creating a complex group improvisation, without overpowering the ensemble with blazing solos. Even the substitution of Bassist Herb Khan for regular William Parker fails to affect the full sound the ensemble creates! The rhythm section is superb, maintaining a loose groove, or engaging in rhythmically free passages without losing each other, never failing to provide the band's lead voices with a solid bottom to work from. In particular, the playing by multi-instrumentalist Danny Carter stands out. He is a brash player, full of ideas, which are executed with a resilient simplicity that reveals a total dedication to instrumental technique. Both his Saxophone work and Trumpet excursions touch the listener emotionally and intellectually, his sound on his axes infectiously joyful! This band uses dynamics as an applied science, an attitude too many "Free Improvisers" lack. They explore all the ranges of sounds their instruments are capable of making, substituting intensity and a full sound, rather than "pile on the Decibels"! Bang's Violin speaks clearly, both within and over the ensemble, making melodic statements of grace, intellectual curiosity and technical excellence. The rest of the CD was recorded in concert at Holy Name School here in NYC. The ensemble's music-making is consistent, a variety of ideas are expressed in turn by the players, pieces of thematic and harmonic material being exchanged, complimented and improvised within an ever shifting aural landscape! Improvising groups that are this tight are rare these days, as it seems that many involved in Improvised music have eschewed the ideas of continuous work and rehearsal by a stable unit, which has lead to much tripe, pompous and ultimately inconsequential music being issued on CD. 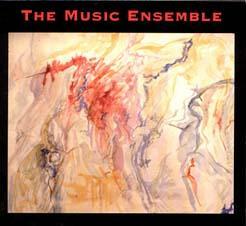 THE MUSIC ENSEMBLE has produced a work that is a tribute to deep musical values of the players involved, and to a time in NYC when artists were able to develop music without the constant challenge of trying to remain "hip" in the conservative media that dominates too much of the musical landscape in NYC. Those interested in Improvisation, or the so-called Loft Jazz movement would do well to obtain this CD. It rewards this listener's efforts to hear it! For more information you can visit the Roaratorio web site at: http://www.roaratorio.com.